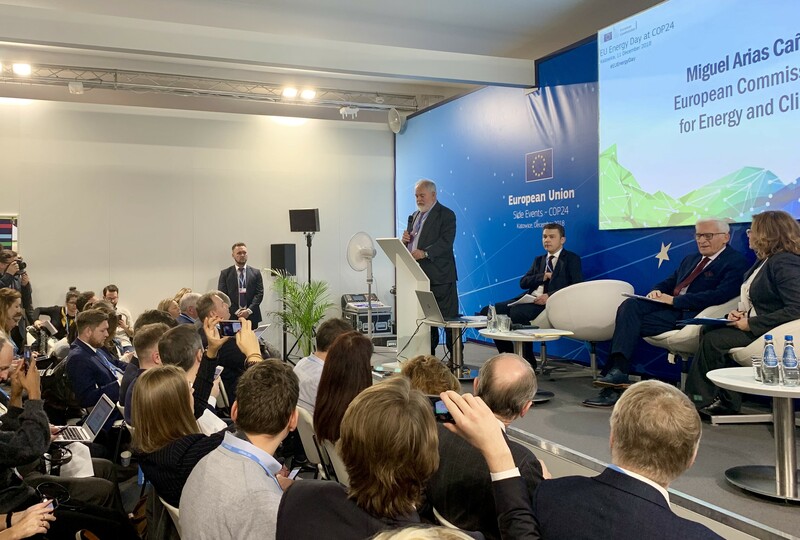 On 11 December 2018, the European Commission hosted the 6th EU Energy Day within the margins of the United Nations Climate Change Conference (COP24) in Katowice, Poland. As part of the programme, an in-depth discussion was held on the Coal Regions in Transition Initiative. Launched in 2016 under the Clean Energy for All Europeans package, its aim is to address the specific social and economic concerns of regions relying on coal mining as the main source of economic activity and employment. Speakers included Miguel Arias Cañete, European Commissioner for Energy and Climate Action, Jerzy Buzek, Chair of European Parliament ITRE Committee, Members of the European Parliament Maria Spyraki and Florent Marcellesi, Markku Markkula, First Vice-President of the EU Committee of the Regions, Grzegorz Tobiszowski, Deputy Minister of Energy of Poland, Izabela Domagala, Member of the Board of Silesia Voivodship and other participants. The transition to a more sustainable future has to be fair and should leave no region and no citizen behind. All Europeans should benefit. Our coal regions in transition initiative helps European countries, regions, communities and workers to the take on the challenge of the required economic diversification of the clean energy transition. We will support them with EU funds but it is also necessary for private money and new investors to come to coal regions to be part of this transition. That is why the EU is also mobilizing international business and finance leaders, including international financial institutions, to support coal regions. Discussions focused on progress made on the EU Coal regions in transition project launched by the European Commission. Over the past 18 months, 6 Country Teams have been launched bringing together experts in energy and climate policy, regional policy, employment, research and development and in structural reforms in order to work with pilot coal regions in Slovakia, Poland, Greece, Romania, Czechia and Spain. The multi-stakeholder Platform set up last year to manage the project has brought almost 300 stakeholders to each of its meetings to discuss transition strategies, projects and best practices. 13 coal regions are already benefiting from direct support and tailor-made assistance to ensure they can maximise the use of EU funds and support tools available in the process of transition. In addition, the EU's Cohesion Policy is also helping regions achieve economic transformation by building on their competitive strengths, embracing innovation and achieving decarbonisation.